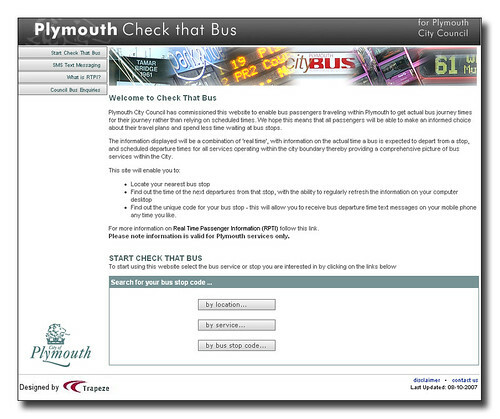 Bus passengers in Plymouth can now receive up-to-the-minute bus times and information on their mobile phones and computers. 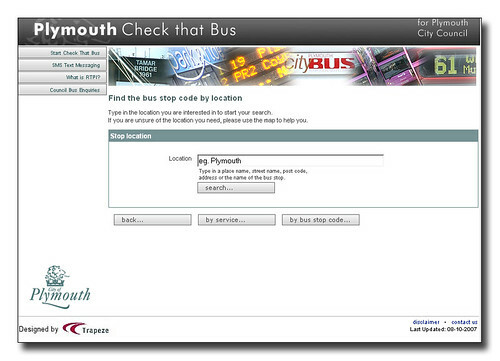 So lets try to find buses from my place of work. Oh dear! First impressions are not good - I look through all 5 pages returned in this search and none of them are anywhere near where I work. Thats better, at least I can select the correct location although the screen design is not that clear. To check its correct I select the View on Map option. Oh dear (again!) 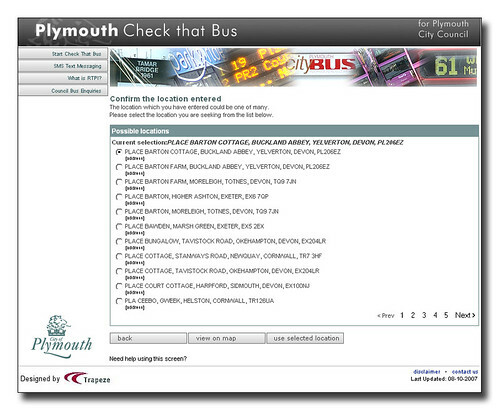 Plymouth City Council sadly dont use Google Maps or any other decent service and instead we get this rather poor map. Not that good to look at, and not that easy to use. The zoom controls didnt work and unlike Google (or most others) you cant just drag the map around to get to the correct location. The biggest issue with this map though is quite simple. You cant see Tamar Science Park on this map - as its not actually pointing to the correct location. Because you cant drag the map its not easy to move it to the correct location either. 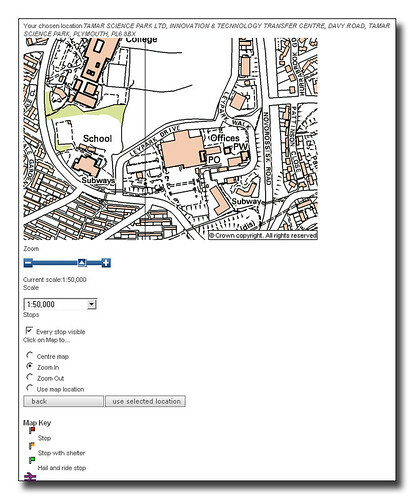 When there are so many really good free mapping services out there its a real shame to see the council stuck with this. 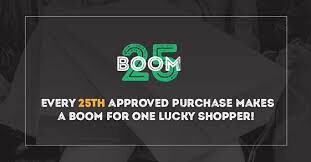 They are probably stuck with it and paying a fortune on it as well! 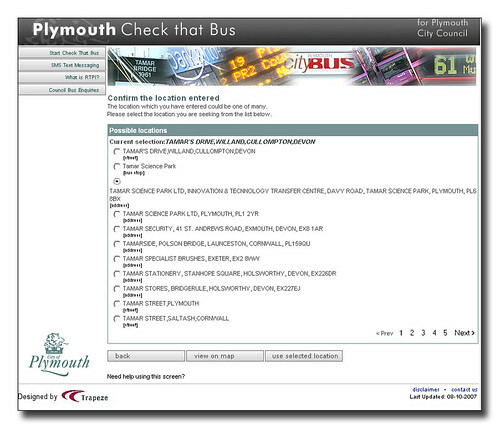 So back to the search by location and try again and this time I use the 'Use this location' button to select the bus stop right outside the Tamar Science Park. Now this should give me the correct bus stop right outside Tamar Science park, but I have looked through three pages of results - and its not listed there. The stops are all at the Asda end of Estover - pretty much where the map was pointing to! Not good for me. I go back to the main search page (screenshot 4 above) and this time try the second entry 'Tamar Science Park' - the one with no address details. Maybe thats the one. I have now tried again and got back into the service. A postcode search on my home postcode was also complete rubbish so I try typing 'Keswick' into the search. Well after hanging around for five minutes it gives up and I get the same error message.